1 of 3 Cook linguini in boiling salted water for 12 minutes. Drain and transfer to a large serving bowl. 2 of 3 Meanwhile, heat oil in a large skillet over medium heat. Cook garlic for 1 minute. Add mushrooms and cook for 3 minutes. Increase heat to medium-high; add zucchini, squash and red pepper flakes. Cook, stirring occasionally, for 3 minutes. 3 of 3 Add shrimp to skillet and cook for 3 minutes or until uniformly pink. Coarsely chop tomatoes; add to skillet along with olives and marinara. Warm through. 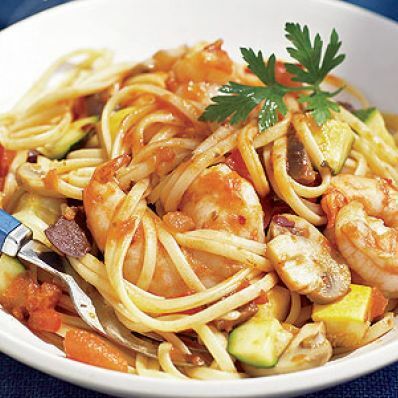 Toss shrimp mixture with pasta in serving bowl. Per Serving: 573 mg sodium, 4 g fiber, 1 g sat. fat, 115 mg chol., 7 g Fat, total, 42 g carb., 23 g pro., 323 kcal cal.